25 million images for a dollar each! Yet another ‘stock agency’ has bulk-emailed the world (why should spam trouble them?) to tell us we can buy images from them for a dollar each. Of course you can’t actually buy a picture from them for a dollar, despite what they promise. You have to start by paying a minimum of ten dollars, at which point they’ll throw in nine extra pictures (which you may or may not want) for free. The pound, the euro, the yen and the rouble don’t concern them; they only want your dollars. The business model is to blind buyers with price and quantity, and gloss over content and quality. Pile ’em high, sell ’em cheap. It’s a well-used model. As for my headline, I have no idea if this site has anything to do with our Russian friends. But there does seem to be a definite Eastern flavour to the content. 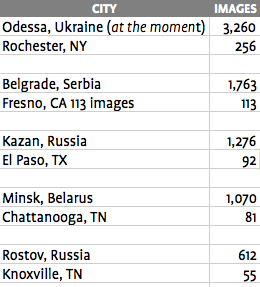 As the table above demonstrates, there are ten times as many images of former Soviet bloc cities than of American cities. Which is very useful if you are publishing to the Eastern European market. Where did this Pictures For A Dollar site acquire its images, do you think? From all the figures quoted, it certainly looks more Eastern than Western. Why does this upset me? Because this has nothing to do with photography. Photographers are not welcome on this site. This is a commodity sale, which will directly affect the livelihood of yet more photographers. I very much doubt that the photographers who supplied the majority of images which ended up on Pictures For A Dollar are going to see a cent for their work. And I don’t think that’s fair. What worries me is how can a picture library (British usage) or stock agency (American usage) like fotoLibra compete? I hope it will be by providing well-keyworded, precise, high-quality, up-to-date AND historical images that people actually want and need, not a dubious flytip of cheaply acquired bulk collections that might pass at a pinch. Or do you have other ideas?